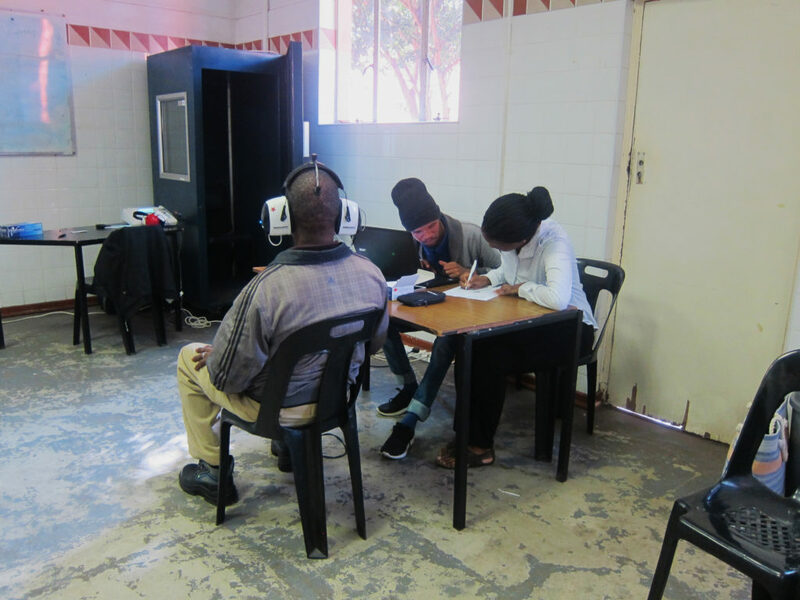 Last week students and educators from the University of KwaZulu-Natal held hearing screenings and diagnostic testing with around 50 informal workers in Warwick Junction, as part of a greater socio-sonic research project. This is aligned to Asiye eTafuleni’s hearing preservation programme and continued interest in health, occupational safety and social protection. 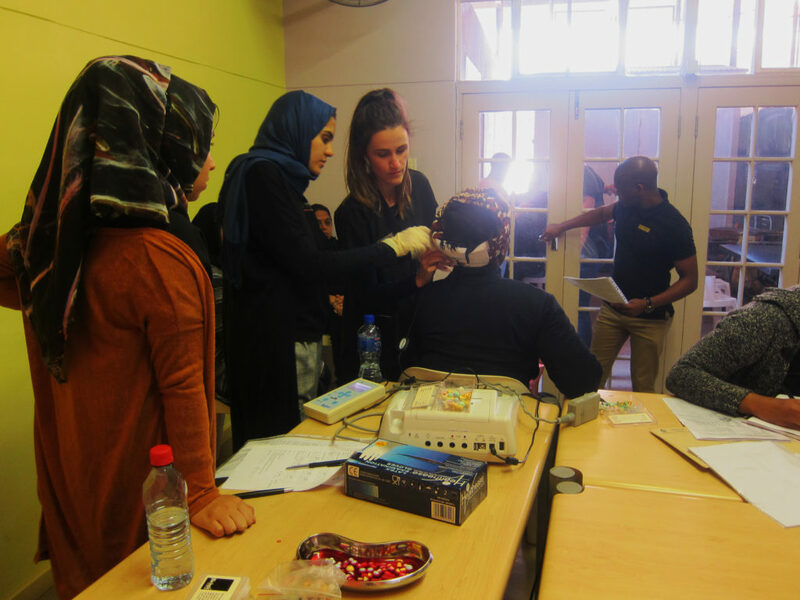 UKZN students perform a hearing screening. Photo: Rebecca Plumbley. Whilst policy regulating exposure to harmful sound exists in formal industry, informal workers do not benefit from this kind of legislative protection. 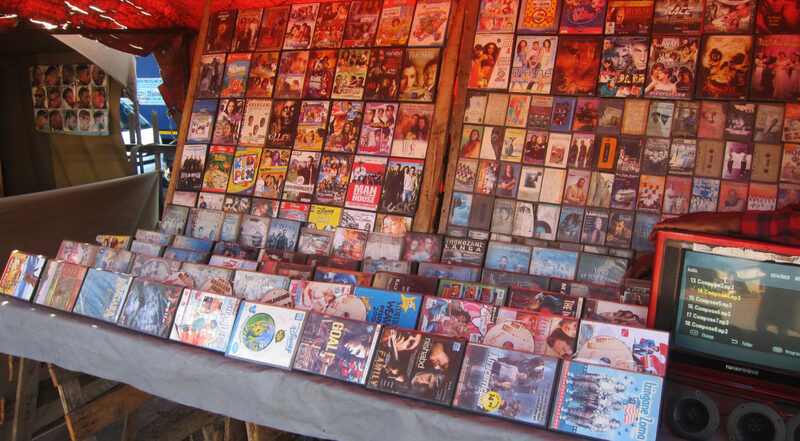 In addition to urban environmental sounds such as traffic, one of the largest contributors to sound in Warwick is traders selling music and DVDs. They are found throughout the market and often compete with one another in volume. Hearing loss is attributed not only to exposure to sound; but additional factors such as exposure to toxic fumes and histories of taking chronic medication also contribute, and are experienced by many informal workers. “We’re dealing with an environment with a high amount of sound. Informal workers are having to put themselves in these high-risk environments for their livelihoods- the hearing program seeks to sensitize workers to their hearing health in a respectful manner.” Seema Panday- UKZN. A trader selling music and DVDs in Brook Street. Photo: Rebecca Plumbley. The hearing screenings are part of an ongoing and developing programme that has been running for the last 3 years and involves educators and private practitioners from the UKZN Speech Language Pathology and Audiology departments and ENT specialists. These collaborations have allowed for more sophisticated medical research and a deepening of the relationship between AeT and UKZN. The program has also given students an opportunity to better understand context. A group of students did initial sound mappings to establish what hearing and hearing health care needs existed in Warwick. Ultimately this research and data collected through the screening will contribute towards a larger scale programmatic hearing conservation response. 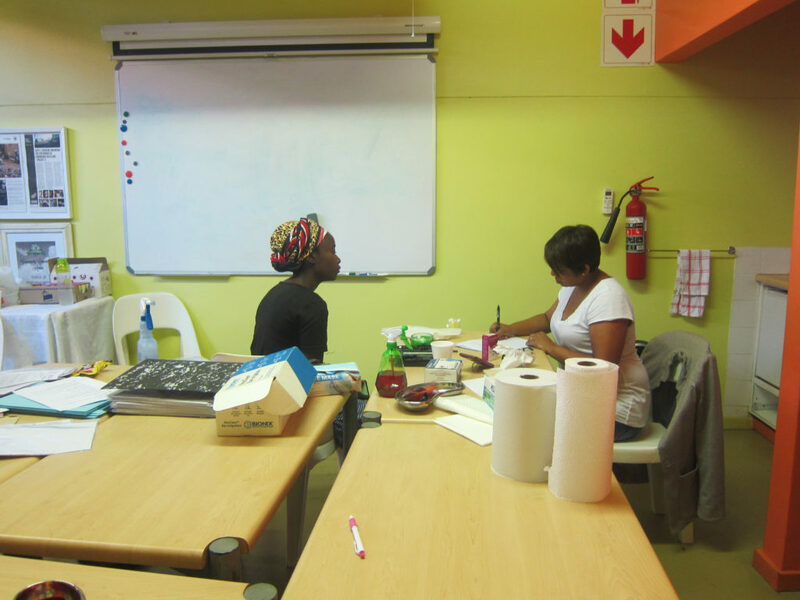 An informal worker has their health history taken. Photo: Rebecca Plumbley. The day of the hearing screenings involved interviews, the capturing of health histories and assessment of understandings around hearing health. Further diagnostic testing was provided for workers that required it- this is linked back to both UKZN services and King Edward Hospital. At a later stage those that were screened will be provided with feedback and further education on hearing. “Over the past three years we’ve come to realise the importance of educating in a relatable manner; we have improved the efficiency of the program and it has become more streamlined. The students are also really learning from this process.” Seema Panday- UKZN. An informal worker undergoes further diagnostic testing. Photo: Rebecca Plumbley. The screening highlights the importance of bringing health services to the workplace. It is common for informal workers to be refused health care at local clinics on the basis that they should be visiting facilities closer to home. 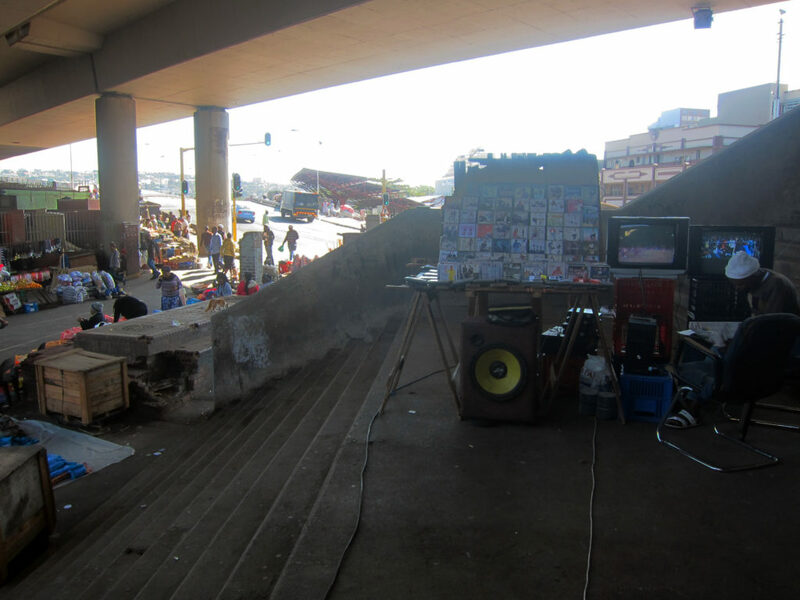 Most informal traders can afford to leave their table for an hour for a check-up or screening, but many cannot afford to take a day out of work to visit the clinic. The hearing conservation program operates at several levels. The provision of this service is useful as an immediate practical response. Future education programs will respond to a need for sensitization to hearing health. The ongoing research, as led by Prof. Mershen Pillay and Warren Manning, will allow for the full complexities of hearing health and the public health requirements to be ultimately incorporated into a programmatic response. These varying responses start to tackle some of the finer grained aspects of the challenges faced by informal workers- pointing to the need for appropriating public space for informal livelihoods, whilst integrating urban design and infrastructure that acknowledges the complex needs of informal workers.